Since 80% of learning is visual, it makes sense that vision problems can have a profound effect on a child's education . Many children who experience academic difficulty often have a visual dysfunction in addition to their primary reading or learning problem. Fortunately, these conditions are treatable through vision therapy. Watch 10-month-old Piper see her parents for the first time, thanks to early detection by an optometrist! Vision develops rapidly after birth. Any undetected vision problem can have a significant impact on infant and childhood development. The earlier a problem is detected and treated, the less likely it is that other areas of development will be affected. Is your child's vision developing normally? Find out using our Child Vision Timeline. A vision examination is a very important step in preparing children for that first day of school. During the school years, good vision is essential to the ability to read and to learn. Any vision problems need to be detected and treated before they lead to a learning and/or behavior problem. If the pre-school or kindergarten offers a free vision screening, be aware that the screening might be incomplete. Many free school vision screenings do not test important visual skills, including eye teaming (binocular vision). Children need a comprehensive pre-school vision examination. 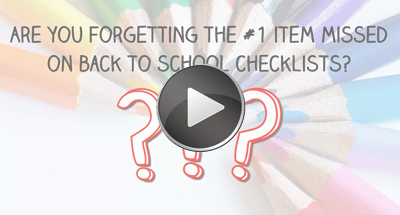 Watch "Back to School - Are you missing something?" Once in school, children should have a professional vision examination at least once every two years. Children considered at risk for the development of eye and vision problems may need more frequent re-evaluation. If your child struggles with reading, it is important to have a thorough vision evaluation by a developmental optometrist, or an optometrist who provides an in-office vision therapy program. This evaluation is focused on how your child uses his or her vision throughout the school day as well as when working on homework (and even playing sports!). Routine eye exams are designed to evaluate the overall health of your child’s eyes and determine if glasses are needed to be able to see the letters on the board in school. A developmental optometrist evaluates how your child’s eyes move when reading, how well they work together, as well as how easily and quickly they can change focus from looking at a book at her desk to looking at the board (in addition to evaluating the overall health of the eyes and whether or not glasses are needed). Locate a Doctor near you to schedule a comprehensive exam!